I teach primarily in my own kung fu studio. I am the owner, head coach and program designer. I pay the bills, open the doors in the morning and lock them at the end of the day. It's very much 'my house'. More recently, I've also been teaching classes at a local middle school. It is an environment, which has its own rules and procedures. I am a guest instructor for a 45 minute once a week program. As a result I am very much an outsider coming into someone else's house. The students who come to my studio want to learn what I teach. They have been inspired by kung fu movies and generally they are ready to accept tough training and a strict environment. They understand that kung fu training is a long tough road with ups and downs. 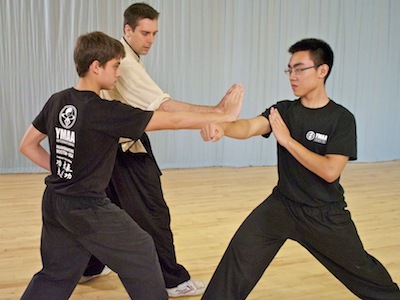 The martial arts studio is a center where they can learn something that they have sought out. At the middle school, however, I am bringing the training to them and the students aren't always interested. Sometimes they are resistant to any physical exercise. A middle school is a different environment than a kung fu studio. The rules and expectations are different. The teaching process is different. The social environment is different. My challenge has been how best to teach kung fu to a group of teens who aren't necessarily looking to learn martial arts. How do I get a student interested if that student doesn't want to learn? My martial arts training is built on the concepts of humility, respect, patience, and I structure my teaching on those same principles. I understand that even though I am the teacher I always have more to learn, that I too am a student. And while I am in a position of authority as a coach, I work hard to make sure there is a mutual respect. Becoming frustrated if progress is slow, or a challenge is failed doesn't help anyone. Just the opposite, if a student fails a belt test or can't understand a technique it is my responsibility to find a way to help him/her understand. A teacher's job is to understand the student and frame things in a way that the student can understand. The middle school program is truncated; I have a group of students for 45 minutes per week for a total of six weeks. After six weeks we start again with a new group of students. In six hours of training at the studio a student might only learn a few basic stances and a kick technique or two. All that translates into very little time to reach a group of students who may not be interested in what I'm doing. There will sometimes be students who are disruptive and unruly. They refuse to participate. My job then is to realize that if the class isn't working and I need to switch tactics. It would be easy to blame the disruptors, but instead I've found I need to be humble enough to take responsibility for the things I can control. I work to find ways to try to inspire the kids and spark an interest in the martial arts and exercise in general. In one instance a student showed a little pride in learning a couple moves. She has a tendency to talk and seek attention. Rather than get upset about her talkative habits I decided to let her demonstrate what she had learned to the other students. She was happy to have the spotlight on her and some of the other kids were inspired by her example. It's hard not to take it personally when a student trivializes the art I've spent 15 years studying. It's something I'm not used to. Every student who walked into the studio does so with reverence and excitement for the martial arts. At the middle school, however, the kids are not only suspect of the material, but they are surrounded by their peers in their most important social environment. The boys and girls are terrified of doing anything in front of each other, which might embarrass them. Making a mistake in the studio is no big deal, we're all in the same boat and we've all seen each other fall on our butts. Making a mistake in the middle school class, doing something you're unsure about, potentially looking goofy as you learn the positions, I could see how the kids might feel awkward. We've all been there. It's important I respect the environment and the overriding social factors which exist there and not at the studio. Arranging the kids into groups in which they feel comfortable and occasionally doing something to make myself look silly can help to alleviate the teenage awkwardness. At the studio I see students progress steadily. I see them grow stronger, more confident and more skilled. When they improve a skill I can remind them of the time weeks ago when they had had trouble with it. With six 45-minute classes I have to pack a lot of material into a short period of time. If I become impatient with the kids for not progressing as I might hope I'll only dissuade them from learning. In order to inspire the students and nudge them towards a lifestyle of physical activity and self discipline I need to show them the small improvements they make and let them know that small improvements like that will lead to great results over time. In our first class the kids can usually hold a horse stance for about 30 seconds. I make sure to take notice of any improvement over time, even a few seconds. Kung fu training is largely based around small, incremental improvements built up over time. I use myself as an example. I tell them that I didn't have much leg strength or endurance when I started, but over time I became stronger. Kung fu is tough; it takes time and energy. Sometimes an opponent is bigger and stronger than you. Sometimes a skill is difficult to learn. Sometimes you lose a competition you think you should have won. The beauty of martial arts training is that it teaches you how to persevere in the face of adversity. It teaches you to examine yourself and your situation and find the best way through a challenge.